Senior Augusto Seraim is a young entrepreneur running a kiosk in Liquiça Municipality in Timor-Leste. As a successful small-business owner he knows the importance of good supply chains and the profitability of his stock. WaterAid in Timor-Leste have introduced the SaTo Pan and are supporting Augusto and other kiosk owners in Liquiça to stock it in their shops. Manufactured in Bangladesh for around $1.50 per unit, WaterAid have teamed up with an importer in Dili to bring them in and make them available for $4.50—which includes a margin for the importer. Augusto sells them for $6 each which is still affordable for a rural family in Liquiça. He buys them as part of his normal weekly trip to Dili to re-stock his kiosk and so the $1.50 he makes on each sale is pure profit. Over the past 4 months Augusto has sold well over 100 units and he reports that every market day people come into his kiosk and ask about them. Not far away from Augusto’s kiosk is Aldeia Kaimegahou, where WaterAid and partners have conducted CLTS triggering. Every household in Kaimegahou has a basic toilet now, and the village has a reliable water supply. 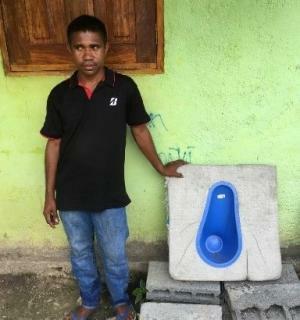 Senior Julio built a basic toilet as part of this process but wants to install a pour-flush toilet because they are superior to the simple pit latrine he built. Sr Julio is now saving money to buy himself a new pour flush toilet. He did not yet know about the SaTo Pan, which costs significantly less than the conventional ceramic pan. However, the word is spreading about this new, cheap toilet option. So there, in the hills above Liquiça town, are all the ingredients for a viable and sustainable market for improved household sanitation. The SaTo Pan is an innovative squat plate developed by American Stand Brands as part of the Bill and Melinda Gates Foundation’s Reinvent the Toilet initiative. It is an inexpensive plastic squat plate that dramatically reduces water use compared with conventional squat plates.